The aboriginal population of this area didn’t have a say in the establishment of Melbourne. They were dispossessed, their land was declared empty and unowned and Australian law legally reduced them to being part of the fauna and flora. Consequently they rarely figure in Melbourne’s public sculpture, they were not part of the collective consciousness of Melbourne for most of its history. They were being officially ignored and neglected. Australian aborigines briefly appear on the bas-reliefs on the Burke and Wills Monument by Charles Summers. The story of the expedition is told in four low relief panels around the base of the statue. Burke and Wills were unwilling to deal the local aboriginal people, the sole survivor John King was help by the Yandruwandha people and lived with them until found by the rescue mission. To prepare the panels Summers lived for six weeks with local aborigines to design the figures on the lower panel and depicts them as dignified, well-proportioned people. This is the first time that aboriginal figures appear in the history of Melbourne’s sculpture. After that public art representing Melbourne’s aboriginal population vanished. For over a century Aboriginal art and identity was official ignored. In the last twenty years it has slowly changed and there is public art representing Melbourne’s aboriginal population by indigenous artists. Amongst the new aboriginal art along the Yarra River in Burrung Marr there is Birrarung Wilam (meaning river camp) by Vicki Couzens, Lee Darroch and Treahna Hamm. Made of stone, wood, stainless steel, bronze, nickel and audio installation, 2006, this is a complex installation with many elements. 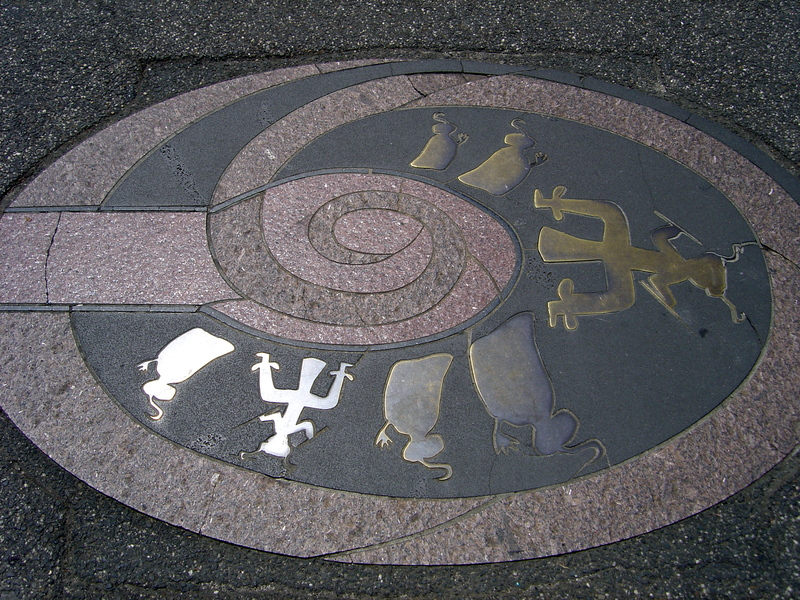 The twisting, textured eel path represents a major food source, the feminine mound “camp site” and the masculine the five metal shields along the riverfront. Marking the site’s eastern and western ends stand intricately carved hardwood message sticks, by Glenn Romanis, representing the Wurundjeri/woi wurrung and Boonwerrung people of the Kulin Nation. 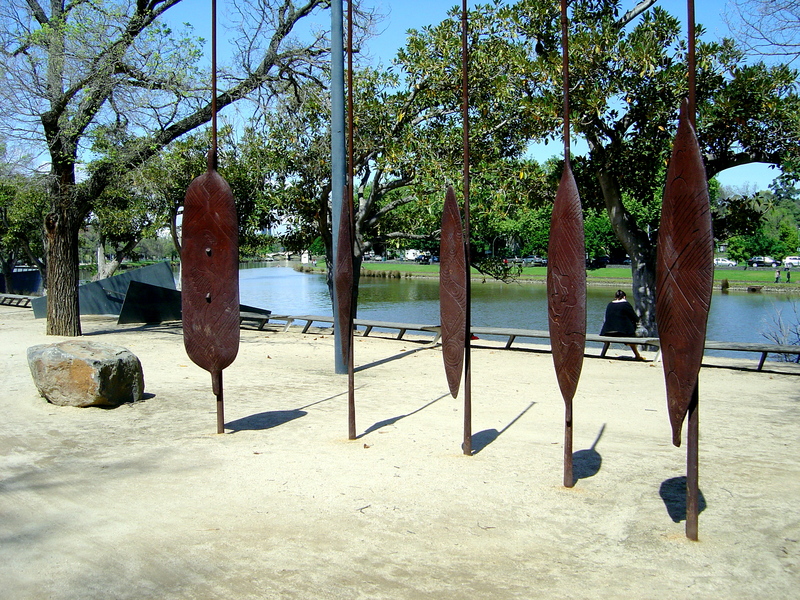 The metal shields by the river, representing the five clans of the Kulin Nation, were designed by Mandy Nicholson who also designed and helped carve the petroglyphs on the stones. Birrarung Wilam detail of rocks in performance area. The performance space is magnificent even remembering that the stones were moved by machines and not by hand while remembering that these ancient British monuments are themselves reconstructions. The best part the ancestral stones the petroglyphs of animals carved on the stones. The monolithic carved ancestor stones are placed to form a semi-circular performance area. Unfortunately they are sort of hidden behind ArtPlay, the children’s arts centre next to a playground. Birrarung Wilam may be a very large and complex work but it is still dwarfed by the scale of this riverside park. 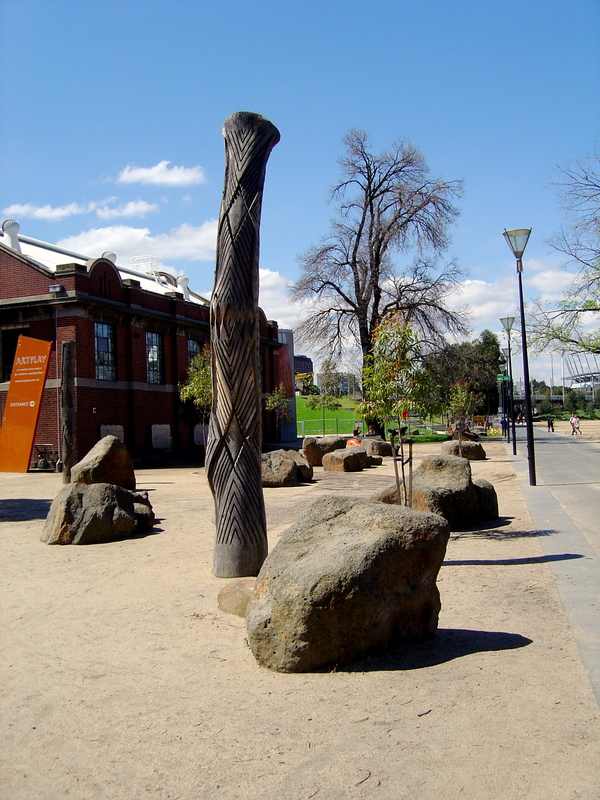 There is room for an entire north bank of the Yarra River and meeting up with the carved poles of Scar – a Stolen Vision (see my post). Indigenous artist were also represented in 2011 the Laneways Commissions with an all indigenous year that included Reko Rennie Neon Natives, a neon light display, Yhonnie Scarce’s Iron Cross in Brien Lane, Melbourne: Two Worlds a painting by the Wurundjeri Council: Judy Nicholson, James McFayden, Asley Firebrace-Kerr and Derek Smith is still up on a wall off Burke Street, and Urban Doolagahl by Steaphan Paton. Very few people in Melbourne would have heard of the Doolagahl before Steaphan Paton introduced them by his retelling of the story in an urban context revives an ancient tradition. 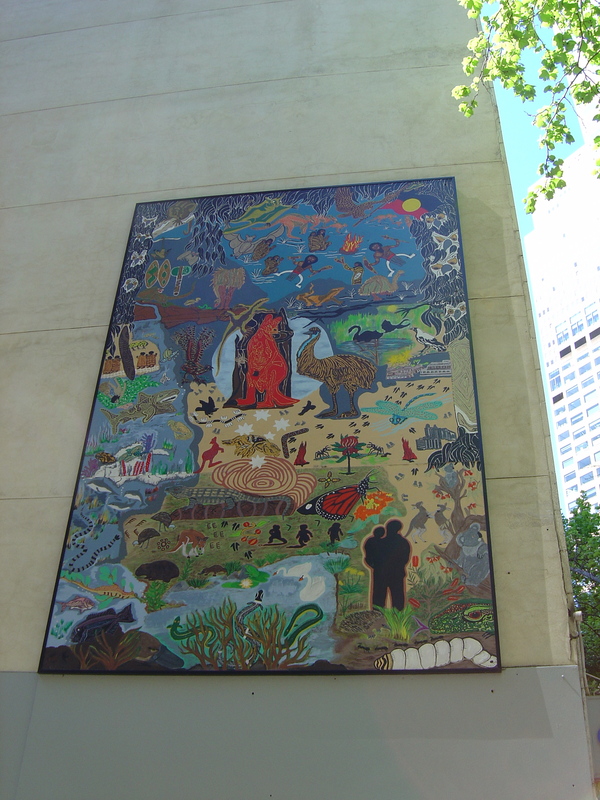 Melbourne: Two Worlds a painting by the Wurundjeri Council, off Burke St. This public art publicly acknowledges the existences of Aboriginal Australia in Melbourne’s collective consciousness. This entry was posted on Friday, November 1st, 2013 at 1:48 PM	and tagged with aboriginal art, Birrarung Marr, Burke and Wills, Charles Summers, Laneways Commissions, Lee Darroch, Melbourne, Treahna Hamm, Vicki Couzens, Yarra River and posted in Public Sculpture. You can follow any responses to this entry through the RSS 2.0 feed. 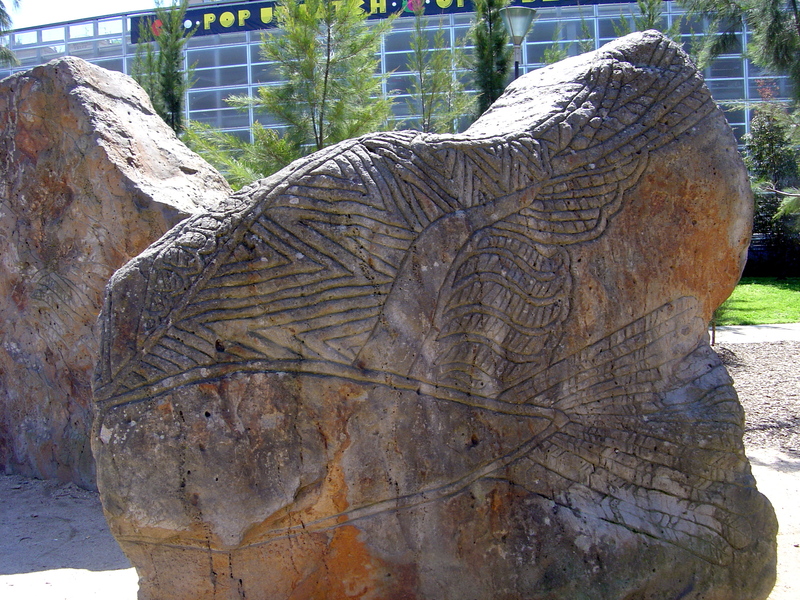 Do you know much about Deborah Halpern’s “Angel located in Birrarung Marr ? I have always thought of it as a piece of art heavily influenced by indigenous Australian art and mythology but I have never found out whether this was the intention of the artist. Thanks. Deborah Halpern’s “Angel” was originally located in the NGV’s moat and has no reference to indigenous Australia or Birrarung Marr. I’ve written about Halpern’s sculptures several times in my blog – for more posts about her try searching using “Deborah Halpern”. Thanks Mandy for clearing that up. I was working from the Melbourne City Council list of public art that listed the three artist. I knew that there had to be other artists and fabricators involved, so I will have to make some additions/corrections to the post. The carved boulders are my favourite element in ‘Birrarung Wilam’. HI Birrarung Wilam (or originally the art project was called ‘Common Ground’). I was the artist who designed the boulders, and carved designs on the shields. If this could be added to your acknowledgements that would be great. Also Glen Romanis carved the large wooden poles . Hi Mandy, Sorry that you haven’t been acknowledged for your work on Birrarung Wilam. There are several problem involved here with acknowledging all the people involved Birrarung Wilam. Firstly my blog is not really about acknowledgement, it is about the art and public interaction with it. Acknowledgement is the responsibility of the City of Melbourne and not an art blogger. I am only using the attribution that the City of Melbourne gives. I am aware that there are more more people involved in Birrarung Wilam but the point of my blog post was not to sort out who did what. Sorting out who did what is a long standing problem in public sculpture that is just getting worse. Artists and other people involved in these projects need to sort out attribution better at the start of the project rather than worrying about it years later.